This is a design by the @tymkrs, the team who designed last year’s DEF CON 26 badge and the previous Cyphercon badges. This one is made up of three different panels placed vertically. The top is the Semaphore panel (named so because it’s printed on the silk screen) which includes an array of 25 LEDs arranged in groups of five. Just above that you’ll see the horseshoe-shaped holes. These are consumables, parts of the substrate clipped off with angle cutters when you visit the paper tape punching machine — it limits the number of times you can get these tapes made to hack your badge. 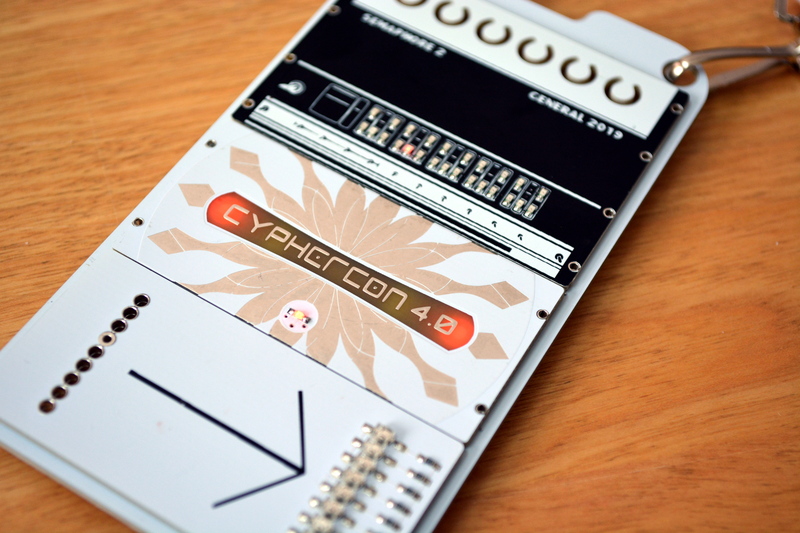 The next panel down is the one with “Cyphercon 4.0” on the front and the coin cell battery on the rear. The final panel is the tape reader and the logic circuitry. Along the right edge of the tape reader you can see the array of IR emitters and sensors that make up the tape reader itself. Along the left edge there is a series of holes intended to act as a guide so you may punch your own tapes. On the back of the badge you’ll find the PIC16F15355. The tape is fed through, with one hole in the center (smaller than the rest) serving as the clock signal. The other eight holes deliver the data. The assembly technique for this badge is incredible. If you look along the edge you can see how the three panels rest on the carrier board. During fabrication some metal stock was used as a spacer to leave room for the paper tape to feed after the panel was reflowed — there are pads on the underside of the panel that mate with footprints on the carrier board. I would be very expensive to manufacture this if you used a contract manufacturer. Luckily, the Toymakers are their own CM so they just splurged on custom processes by adding to their own labor. It’s really impressive to see the modular design and commitment to making this work. I like it that the depth of the carrier board helps to reduce how far the battery holder for the CR2450 coin cell sticks out. Here are detailed views of the panels. The rear-mounted LEDs on the battery panel are red/green, and the LEDs on the semaphore panel are red only. The conference is called Cyphercon, so it’s not surprising there’s a puzzle to be solved. You find tape patterns on the back of the badge and in the conference guide book. Badges for presenters and organizers are different and I assume you need to collect all the patterns and assemble them to unlock what’s hidden within. It’s a beautiful badge, even if you’re not trying to solve the badge puzzle. But the interactivity is so enticing. So far I’ve seen one team who brought a laser printer and transparencies to make their own tapes, leaving the “holes” unprinted on the strips. And another person mentioned trying to connect directly to the IR sensors with another microcontroller to electrically spoof feeding tape through it. It’s a simple mechanism, and a hit for everyone trying to solve the puzzles at this conference. Here’s a video about the badge made by Toymaker’s to explain the activities involving this badge. The Hackaday Superconference is all about showcasing the hardware heroics of the Hackaday community. We also have a peer-reviewed journal with the same goal, and for the 2018 Hackaday Superconference we got a taste of the first paper to make it into our fully Open Access Journal. It comes from Ted Yapo, it is indeed a tale of hardware heroics: what happens when you don’t want to spend sixty thousand dollars on a vector network analyzer? Ground is an interesting topic when it comes to engineering. Either it’s the reference level for a digital circuit (not necessarily at zero volts, either), or it’s the return path for current, or it’s the metal chassis, which shouldn’t be the return path for current or else something’s terribly broken. Erika Earl’s talk at this year’s Hackaday Superconference is all about ground. We live in a Golden Age of single-board computers. There was a time when a portable computer that was any good was a relatively rare and expensive device, certainly not something you could expect to replicate for yourself. A Psion, or later a Palm or perhaps a WinCE device would have been a lot more than an impulse purchase, and could not easily have been replicated using the components then available to the experimenter. The Hackaday Superconference is happening right now and you can join in on the Livestream. Talks begin at 10 am Pacific time on Saturday and Sunday. From the outside, integrated circuits are mysterious black boxes. One of the many highlights of the Belgrade conference was, of course, the badge. The 2018 Hackaday Belgrade Badge is a masterpiece of hardware with a 55-key keyboard, RGB TFT LED, speaker, and a BASIC interpreter. Hackers on Planet Earth, Here We Come! This weekend is HOPE XIII. The Hackers on Planet Earth conference is a biennial event held in New York City. Dating all the way back to 1994, HOPE is an excellent collection of people and ideas. I was lucky enough to attend two years ago (my first time) and had a fantastic time meeting Cory Doctorow after his rousing talk about DMCA 1201, I got to hear Richard Stallman discuss why all software must be free, the talent show was off the hook, and there were fun people to hang out with at every turn. Hackaday Belgrade is On: Join LiveStream and Chat! Good morning Hackaday universe! Hackaday Belgrade 2018 has just started, and we’re knee-deep in sharing, explaining, and generally celebrating our craft. But just because you’re not here doesn’t mean that you shouldn’t take part. Watch the talks along with us on the livestream. Take part in the conference chat. Greetings from beautiful Belgrade! With the Hackaday crew arriving over the last couple of days, preparations are in full swing, and the excitement is building for Hackaday Belgrade 2018 on Saturday. Here’s all the news you need to know. The final conference schedule has just been released and it’s super. Hackaday Belgrade preparations have now passed the flash point and the hacker village that is set to descend on Serbia in a few weeks grows larger and more awesome by the day. Prepare for a massive data dump on what is in store. But before you go any further, make sure you have a ticket. What is Hackaday Belgrade and What Comes with a Ticket? On Saturday, the Hackaday Community from across Ireland and other parts of Europe poured into the performance hall at Dublin’s Project Arts Centre for a massive collection of talks. From rediscovering century’s old technology, to cutting edge research projects, we heard talks from dozens of attendees on the technology that is interesting them most right now. What time is it? It’s Midwest RepRap Festival time, and it’s happening this weekend in beautiful Goshen, Indiana. It’s free, it’s open to everyone, and it’s the greatest 3D printer convention on Earth. Hackaday has won 1st place in the RedBull Creation contest! MakerFaire North Carolina, We’ll see you there!